You can drive all over Baxter and find large sections of infrastructure that serves nothing. You can find roads to swamps, sewers that serve forests, fire hydrants protecting vacant ground and fully serviced lots converted to stormwater holding ponds. But if you know what you are looking at in the developed areas, it is actually worse than those obvious examples of waste. The number of subdivisions where tens of thousands of dollars worth of infrastructure serves homes valued at low multiples of that investment are staggering. An engineer visiting from a foreign land would conclude we are indisputably the wealthiest nation on earth to be able to afford to get so little return from our public investments. But can we really afford it? The obvious answer is: no we can't. The more difficult question, however, is what would a Strong Town do differently? Answering that question is what this series is all about, and I'll use the construction of Forestview School that I discussed in the last post to give a concrete example. Now let's preface the answers by saying that the people involved in putting this deal together - people that I know personally and have learned a lot from professionally - are very intelligent. They do what they do better than anyone I know. It is not them or their decisions in question - they are the best at making this model work. It is the model itself that needs to be called into question. What would a Strong Town do differently? The first answer is that this is not the right site. With all of the infrastructure that Baxter has in the ground, there has to be a location within the district where there are existing utilities that could be more effectively used. Find that spot - or those spots - and start there. This may mean that there is a different design, a different emphasis or a different concept that is developed for the school. So be it. Engineers and architects are best used to develop creative solutions for unique spaces. Anyone can do greenfield. Some possible locations - the acres of parking lots along the Highway 371 corridor that are rarely used for anything, yet are fully served with utilities. The abandoned golf course property in the middle of Baxter, again fully served with utilities. The numerous residential subdivisions with full utilities that have ample vacant lots and few potential buyers. (For context, this project was undertaken in the height of the building boom, which is bound to make some of this seem like cheap criticism with the benefit of hindsight. In reality, it demonstrates how everyone was caught up in prosperity/growth scheme and failed to ask the obvious, pragmatic questions about the pattern of that growth). In this photo I have outlined the approximately 12,500 feet of watermain in blue. (Note, I don't have a map that shows exactly where the pipe is but can estimate based on hydrant locations). Note that it necessarily surrounds the school with high-capacity pipe to provide the necessary fire protection. Here is what a Strong Town would do now. While the roughly 100 acres of greenspace not used by the school makes a nice setting, it is an unrealized value that should be captured. As part of putting in this infrastructure, the City should have required enough density to cover their long-term maintenance costs. 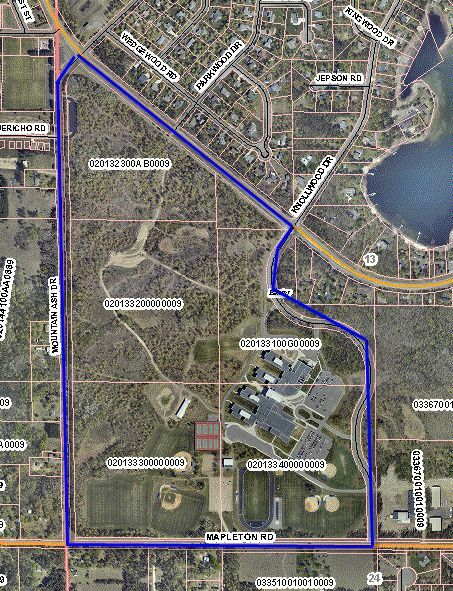 If this 100 acres were developed at a density of 3 houses per acre through a cooperative agreement with a number of area developers, you would have 300 homes within walking distance of the school and a stream of revenue to pay the cost of maintaining the utilities. For the school district, the development could have meant revenues to offset the overall construction - a "profit" of just $15,000 per lot would net $4.5 million, a little more than 10% of the total project cost. There are people who will read this (and I am amazed at how much our readership grows each month) that will immediately raise objections. We don't want 300 homes next to a school like that. Nice idea, Chuck, but we're in a recession and we are not going to get 300 new homes anytime soon. Who would want to live 3 units to the acre? Nobody we want living next to a school with kids. The school district is not in the development business. We don't want them competing with the private market. On Wednesday, I will answer these objections and any others that are raised in the comments section. Change is difficult, but it is necessary if we want a Strong America for future generations.